The week before Christmas in 2016 we attended our first NFL game together. Mel is a lifelong Green Bay Packers fan and Pete just so happened to fly into Chicago the day before they were due to play Chicago Bears at Soldier Field. The game also coincided with a bitterly cold snap and in the build up to the event it was at one point being billed as possibly the coldest NFL game in history to be played at Soldier Field. 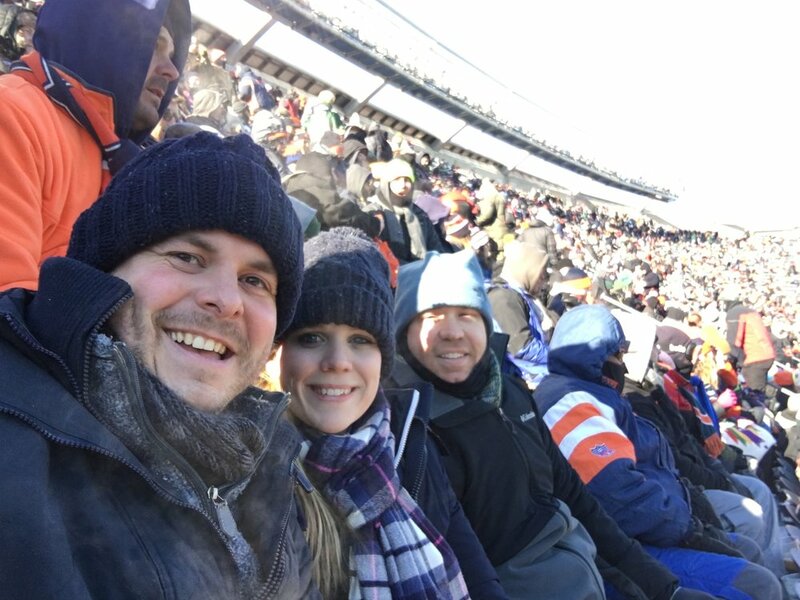 As it turned out, it didn't quite make it to those depths but with game time temperatures of just 11f (-12c) and a windchill factor of -4f (-20c) we were thankful for the mountains of extra blankets that we took with us to our lofty position up in the stands. As a spectacle, and as Packers fans, the game couldn't have gone any better. Green Bay raced to a seemingly unassailable 27-10 lead after scoring 17 points in the 3rd quarter, resulting in thousands of Bears fans streaming out in search of warmer climes. We couldn't blame them as by this point we'd lost all feelings in our toes. For no explicable reason though the Packers then did their best to collapse as Chicago brought the game level and we braced ourselves with the prospect of having to sit out in the cold for overtime. Thankfully, with pretty much the last play of the game and only 3 seconds left on the clock, the Packers nicked it with a field goal. What a game. Mel's brother, Matt, attempting to keep warm.